Franchise Business Established: 2006 in Australia. 1985 in UK. Marketing Support: Comprehensive marketing support provided. Agree Terms: 1 _ 5 years. License 1 year. Franchise 5 years. 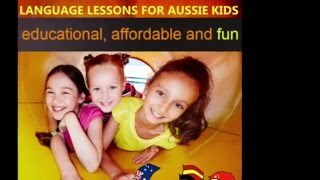 LCF Fun Languages Australia specialises in teaching languages (French, Spanish, Italian, German or Mandarin) to pre-schoolers and primary aged children between the ages of 0 months to 12 years. Our language programme was established 25 years ago in UK. LCF Fun Languages Australia has been operating for over 12 years. We operate in 100s of primary schools and childcare centres across Australia. We are growing fast in the Australian market because kids, Childcares and schools simply LOVE our language clubs & movement and music programs, and we have a passionate and enthusiastic team delivering them! Work from home, you choose your own timetable! If you are curious about starting a small business that will give you a more flexible lifestyle around your family? Do you wonder how you can utilise your skills and languages to create a business you are passionate about? Are you an enterprising, mum or dad looking for a way to earn an income? Established in 1985. Proven and established systems in many countries. We are seeking interest for licensee and franchisees across Australia.